Patek Philippe International magazine, Spring 2008: My first published work, Patek flew me out to Michigan to meet artist Thomas Allen. I talked to him about his photography wherein he cuts, folds, and poses the covers of old paperback books to create a unique moment. I have stayed in touch with Mr. Allen since, and it's always a delight to see his work in print (magazines such as GQ illustrate articles with his photos, and his works are also used for covers of novels). I one day hope to own one of his works, but right now, that's something more for the Wish List than the Getting Things Done List. Patek, Spring 2011: My next assignment for Patek was more difficult, and was the closest thing I've had to math homework since college. 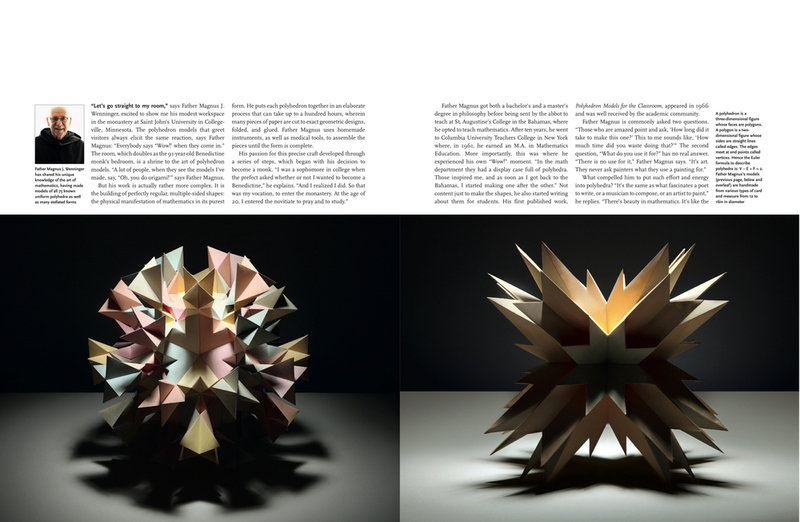 Before I flew out to Minnesota to meet Father Magnus Wenninger, a Benedictine monk, I studied his passion: the creation of polyhedron models out of paper. His book, Polyhedron Models, is very intimidating to a liberal arts college graduate whose mathematic expertise has been known to be foiled by splitting a large bill at a restaurant. That all being said, I am very proud of how this article turned out. Patek, Spring 2011: The trip to interview Father Wenninger was immensely fruitful, as I managed to interview WWII veteran Charles Woehrle in the same weekend plane trip. Mr. Woehrle was a prisoner of the same Nazi prison camp the film The Great Escape was based on. Instead of reading a black-and-white mathematics book, I got to watch a movie for preparation. This is the first edition of Patek's Life and Times series, profiling owners of their watches.